Here’s an epic one. 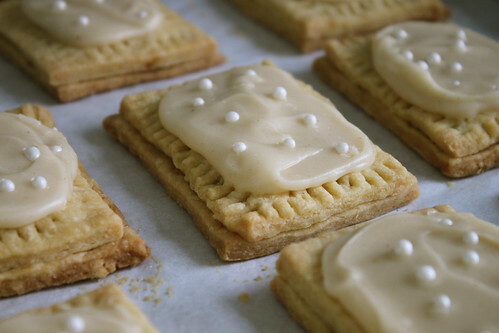 POPTARTS. All caps are definitely necessary. 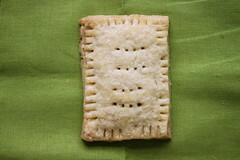 I am indeed internet-shouting about POPTARTS. POPTARTS! If I’m being honest, I actually like the artificial, goodness-only-knows-what’s-in-them poptarts you buy at the grocery store. But these guys are a whole different breed. They probably shouldn’t even be called poptarts. More like handheld pies. Or little pockets of heaven. Either way. Then you fill the pie dough with whatever you want. 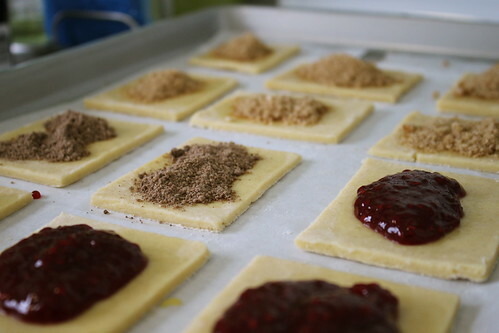 Like raspberry preserves, mixed with a bit of flour to thicken things up. Or cinnamon sugar, which turns gooey and delicious when baked. Or if you’re Norwegian like me, you make a little Scandinavian spice mix just for kicks and put it in a couple. You could even put nutella inside if you’re feeling really adventurous. Then you bake them. Let them cool (good luck not eating one hot out of the oven and burning yourself). The non-fruit-filled ones need a little something on top, so make yourself some killer browned butter glaze, which happens to be my favorite thing to put on cupcakes, cookies, on a spoon… and decorate! Whisk together 1 egg and milk; set aside. In a large bowl, whisk together flour, salt, and sugar. 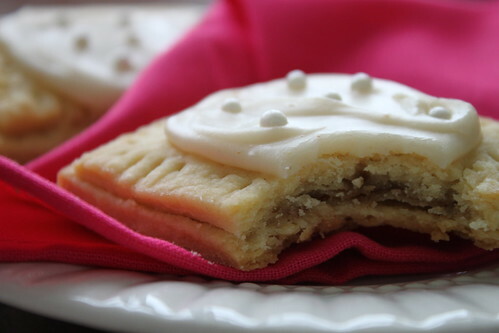 Using a pastry cutter, cut butter into flour mixture until the butter is in pea-sized pieces and distributed evenly throughout; you may need to use your hands. Stir in the egg mixture until just incorporated and dough sticks together, kneading just a little bit in the bowl; it will still seem a bit dry, but that is fine. Separate dough into two halves, shape into rectangles, wrap in plastic wrap and chill for a half-hour while you assemble the fillings you want below. While it’s chilling: Preheat your oven to 350 degrees F. Assemble the fillings. Line a baking sheet with parchment paper. Beat the second egg and set aside. Now take out one of the chilled dough halves and set on a floured surface. Roll into about 1/8″ thick rectangle, then use a very sharp knife to cut into 3″x4″ rectangles. (If you’re a perfectionist, the Smitten Kitchen method is for you; if you don’t mind poptarts with character like mine above, just wing it.) Gather scraps, repat the dough, etc. 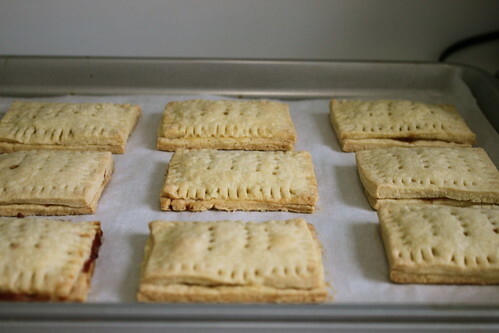 until you’ve got about 12 poptart bases, which you should set on your baking sheet. Grab your other dough half and repeat the above until you have 12 poptart tops; set aside. Brush the poptart bases on the baking sheet with the beaten egg, covering to the edges (it will be the “glue” that holds the top and bottom together). By scant tablespoonfuls, dab the filling of your choice onto the bases, leaving an edge around them so they don’t leak out. (Watch out: raspberry preserves are especially leaky, so don’t be too generous.) Place tops over the bases and press the edges together with your fingers to make sure they adhere. Use the tines of a fork to decorate the edges and further secure the two pieces together, and poke holes in the top to allow steam to escape. Bake for 20-25 minutes until golden brown and flaky looking. Remove and cool completely. 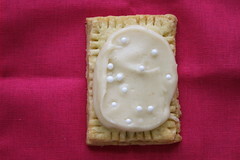 If desired, make browned butter glaze (see recipe below) and decorate the tops of the poptarts. I used these sugar pearls for mine. You can increase or reduce the recipes below to “mix and match” and fill the poptarts as you like. For all of them, simply mix together in a small bowl with a fork. Put this on top of the cinnamon sugar and/or Norwegian spice filled poptarts. 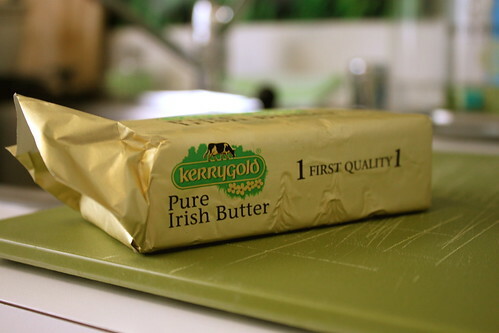 In a saucepan, heat butter over medium heat, stirring occasionally, until golden brown and fragrant, about 5-10 minutes. Pour into a separate bowl, leaving sediment behind. Add sugar, vanilla, and 1 tablespoon milk and stir vigorously together until very smooth. If the glaze seems too thick, add a 1/2 tablespoon more milk. Use immediately. Thanks for your kind comment, Tammy! Let me know if you try out my adaptation of the recipe! Yum, these look tasty. I haven’t really been able to get pop-tarts here since the 90’s and some times I get an odd craving for them. I think I’ll have to try these one day, they look like a great morning breakfast!